A fine art print of "Grazing on a Colorful Mountain" will brighten any room. Hang it in the living room or dining room for a colorful conversation starter. 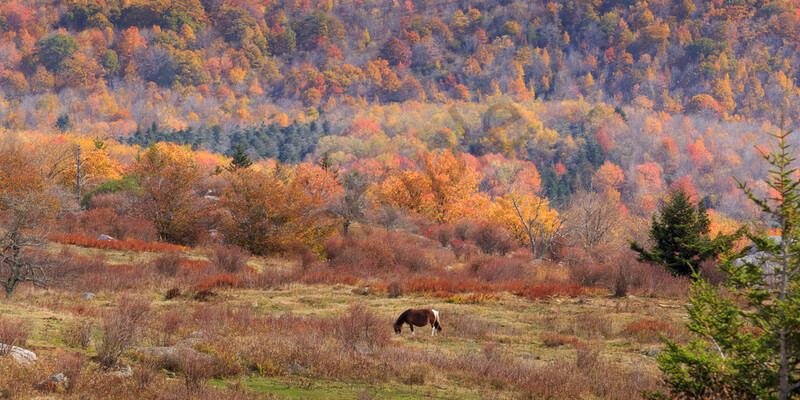 The autumn colors carry the eye through the image while the Highland Pony calmly forages for breakfast. Enjoy a trip to the Virginia mountains every morning! Grayson Highlands State Park is a gem tucked into the Southwest portion of Virginia. Armed with towering mountains, broad fields and wild highland ponies, there is plenty of beautiful scenery for everyone! A hike to Mount Rogers fills the day with lush forest, high plateau and a winding climb. A perfect rest area on an open ridge provides a wide view of the bursting colors. A beautiful chestnut-colored pony grazes the large field, nimbly moving among the varied terrain. "Grazing on a Colorful Mountain" is a part of my Mountain Wall Art series. Best displayed on metal for a modern look, the vibrant colors and fine details are displayed in refreshing clarity. If you prefer a warmer, softer and more classical look, choose a canvas print; the image achieves a warmth and vibrance that brings the scene to life. Each museum-quality canvas is professionally stretched over a wood frame and ready to hang upon arrival. Two museum-quality fine art papers are also available, should you prefer a more traditional presentation.